Get GIMME THE LOOT to SXSW and ND/NF this Spring! 289 backers pledged $24,036 to help bring this project to life. When Malcolm and Sofia's latest graffiti masterpiece is buffed by a rival gang, these two determined Bronx teens must hustle, steal, and scheme to get spectacular revenge and become the biggest writers in the City. That’s the jumping off point for an exciting adventure that showcases some incredibly talented young actors in a story that's fun, thrilling, and simply a great time at the movies. GIMME THE LOOT was shot this past summer on the streets of New York thanks to the support of countless friends, family, lovers, and Trinidadian restaurant owners. NOW WE NEED YOU. GIMME THE LOOT requires crucial funds to complete the movie (editor, sound mix, color correct, mastering, travel, publicity and marketing - phew!) and have something special to screen this Spring! This is a passion project in every sense of the word, and the passion we all feel for this story, this setting, and these characters hopefully translates on-screen. We are honored that the IFP/Lincoln Center's EMERGING VISIONS program, SXSW, and New Directors/New Films agree and now we want you to become a part of GIMME THE LOOT! Please check out our video above, which includes a trailer and a message from our good friends Sam and Meeko . One of them is a nice Jewish boy and the other has tattoos on his face... see if you can guess which one is which. So what is this Kickstarter thing? Well, Kickstarter is an innovative funding platform for creative projects and it's all-or-nothing - If we don’t raise our goal of $22,500, we get nothing. Nothing! Our campaign will last just 25 days but please pledge now – it will help build momentum. Thank you! Greg Lamarche (graffiti consultant to the film and design for poster): http://www.greglamarche.com/home.htm The poster is in progress but here's how it is coming along. Here's what it's like to get a tattoo with Meeko. You want this experience. Thanks for the high-five! There are 1,743miles between New York and Austin. Think you can encourage more to give us high-fives for each mile of our journey? Thanks for standing behind us! We'll list you on the website (let us know if not okay) because we want the world to know you're awesome. Leon "air" making out with you, hot and sloppy style. Plus we'll thank you on the website. MUSIC! A mix tape from Nicholas Britell, our versatile and fantastic composer, which includes his own original compositions for the movie as well as other works that inspired the film. TICKET! Show NY decision-makers that this film should be seen! Pre-buy a ticket to a screening in New York and you'll receive a ticket for its theatrical run or at a private event. Thank you on the website and air make-out video. PRINTS + MUSIC! You'll get one of Grace Difford's amazing prints (limited series, see above prize) AND the mix cd plus the air make and website thank you. Quite the bundle. THANK YOU IN THE CREDITS! Your chance to be a part of Gimme the Loot immortality - get your name in the credits, a mix cd, ticket to a NY screening and an air-make out video. FUN CREDIT! Working on a movie is hard. Getting a crew credit on Gimme the Loot? Easy! All you have to do is fork over some hard earned dough and you can be either our Fight Choreographer, Stunt Coordinator, CGI Supervisor, Matte Painter, Assistant to the Traveling Secretary, or Upholsterer. - get your name in the credits, a mix cd, ticket to a NY screening and an air-make out video. 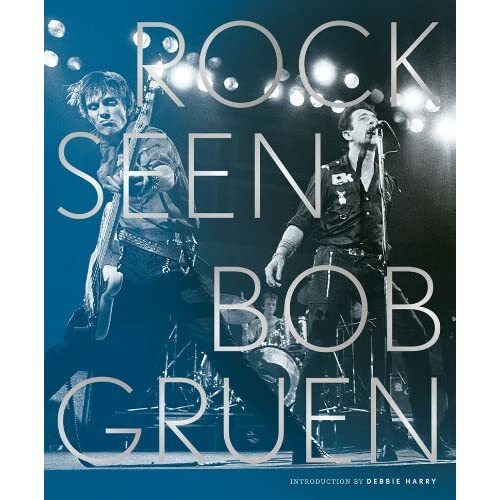 ROCK SEEN BOOK: Bob Gruen has chronicled the rock world through his famous photographs (including the iconic John Lennon NYC portraits) for over forty years. Personally donated and signed by the artist. NYC TOUR! Sam Soghor is not only an actor, producer, and our location manager, he's also a licensed NYC tour guide and expert on the hidden treasures of the city. Sam will cater an outer borough tour to your interests, and you are guaranteed to uncover new discoveries, learn fascinating history, and be entertained by a funny, unique, and charming native New Yorker! Check out the video if you don't believe us - Also get a thank you in the credits, a mix cd, ticket to a NY screening and an air-make out video. TATTOO! The one and only Meeko, is the king of tattoos (watch our video to see). He will personally go with you to get your very own tattoo while getting one himself, and we will document the experience in a short film made by Adam Leon. An amazing once in a lifetime opportunity and a story you'll tell your grandkids as they'll sit in awe and realize they will never be as cool as you. - Also get a thank you in the credits, a mix cd, ticket to a NY screening and an air-make out video. NYC PREMIERE: Oh, we gonna do this up in style! We will pick you and a guest up and head to the NYC premiere of GIMME THE LOOT at the prestigious NEW DIRECTORS/NEW FILMS festival. In addition, that same weekend you'll join writer/director Adam Leon and at least one cast member for a world class meal. AND get your name in the credits. Fancy pants or what?! ASSOCIATE PRODUCER: Your chance at the big time! You will receive an Associate Producer credit on the credits and imdb. Power lunches, casting couches, Beverley Hills mansions, celebrity hook-ups to surely follow (but not included).